People’s History Museum (perfect venue right!) in Central Manchester on Friday 1st March 6pm-8pm. We are really excited to invite you to the unveiling and it promises to be a very special event and one that all craftivists should be proud to be part of. ALL ARE WELCOME but we are especially hoping jigsaw-makers will attend so we can share this night with you after your support of this project since October 2012. Can you come? 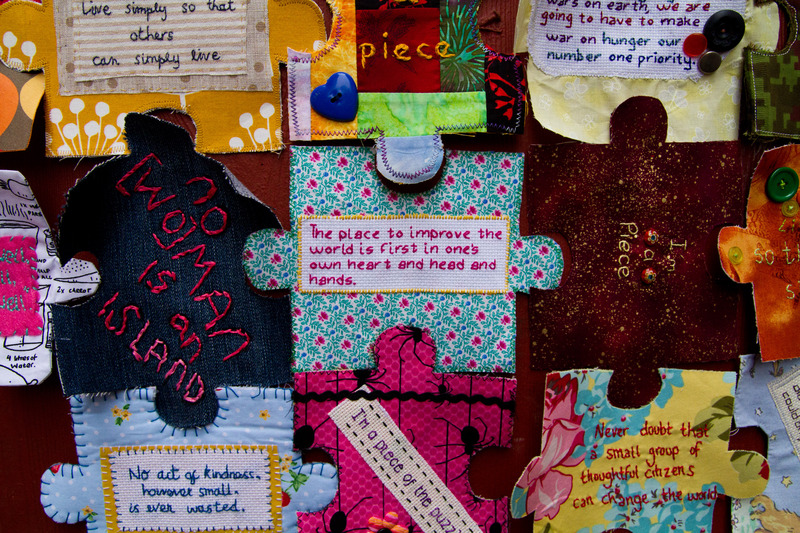 At the showcase there will be a craftivism table so people can make a jigsaw piece for themselves or their MP, an interactive game on the Race Against Hunger campaign and the opportunity to have your photo taken with the installation and just admire each piece. There will also be a complementary non-alcoholic drink each, nibbles and a bar you can buy more from (inc alcohol if you wish). If you need to park a car we can get you discount on the local car park area. It should be really relaxed evening and we would love you to attend & do share this with other people you think might want to come- the more the merrier! RSVP- Please RSVP to craftivist.collective@gmail.com if you can just to help us with names and numbers. Life is like a puzzle, it all seems a mess but when it gets finished it looks brilliant. This project aims to show that we are all connected and our actions make a difference. There is no one solution to the problem of injustice but we can all play a part in a movement for change. We are supporting Save the Children because, as well as being a conscious consumer, this is a vital time to effect long-term change through campaigning and meeting your MP. We can’t miss this opportunity.